To complete your GreenGrid vegetative green roof system and realize all the potential benefits, GreenGrid offers several innovative accessory products to increase ecological performance and aesthetic appeal. Performance enhancements include irrigation system options and additional stormwater management tools. Aesthetic enhancements include several patio and walkway paver options to fit your needs as well as durable edge treatments for a crisp, finished look. 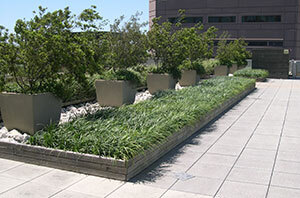 Integrating hardscape design features into a GreenGrid vegetative green roof is simple, effective, and attractive. Since the system was designed on a 2’x2’ grid pattern integrating pavers (concrete or rubber) is a snap as most of these accessory items are also based on a 2×2 grid. 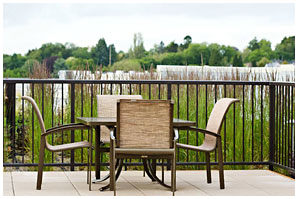 Decorative edging, planter boxes, and other garden accessories can be easily integrated as well. The true flexibility of the GreenGrid System allows designers to create amazing projects, yet still upholds the ease of repair without damage to the overall vegetative green roof system. 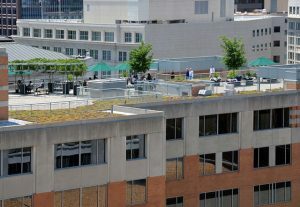 When considering a rooftop amenity space, the sky really is the limit with respect to green roof design. Vegetation on structure has been used to create everything from simple rooftop terraces with planters to roof decks surrounded by simple or ornate plantings, and accessible rooftop gardens to city parks that never indicate the fact that they are actually a green roof over a parking garage or other subterranean structure. GreenGrid is particularly well suited to designing beautiful, welcoming green roofs where the structure has between 30 and 75lbs per square foot of capacity. Our multiple depths allow for mixing and matching of shallow modules with groundcovers, deeper trays with tall ornamental grasses and flowering perennials, and even planters with trees and shrubs strategically located. The standard sizing of the modules meshes seamlessly with standard hardscape materials that are also available as part of your complete GreenGrid system including concrete, rubber, and various hardwood pavers, bamboo decking and pavers, a complete line of fiberglass planters, edge treatments, and other coordinating accessories. The GreenGrid system is also designed to easily accommodate irrigation systems, wiring, and other features that are often part of a rooftop garden. GreenGrid-powered amenity spaces truly shine when the modules are pre-grown to maturity under professional nursery care, delivered and installed quickly, providing a brochure or ribbon cutting-ready rooftop garden immediately after installation, and for years to come. We’ve included here some photos of successful amenity spaces that depict a wide range of design philosophies and use cases. Let us know what you may considering for your project and we can help you create a cost-effective, high value space for your building.